My apologies for not posting here recently (except the two Memorial Day pieces earlier this week), and for not being able to get the latest articles and training aids posted on the Pilkington Competition web site by now. I have been busy with work (I guess that is a good thing!) and have not had a chance to prepare everything and get it sent to Scott. I will get on that…! In addition to posting articles 47 through 56 (just published this week in USA Shooting News), training aids to be posted are: two Ambercise routines, NPA Process, Rifle Front Aperture Selection, and Shooting Outlines: The Shot, The Shooting Session, and Qualities of a Champion. I will post a notice when they are available. To be notified of new posts, go to the “Home” page and select the small blue “Follow…” link on the right side of the page just above the search box. This is one of two remembrances I am posting today. Neale M. Shank and William E. Krilling. See also the post about my first coach, Alfred Perrott-White. Memorial Day often includes family picnics, parades, and other celebrations of life. These celebrations, and indeed this life we enjoy, exist because of the sacrifices of our military. And it is our fallen military people for whom Memorial Day was created. They gave the ultimate sacrifice for us. As we celebrate, it is important that we celebrate their lives and remember their sacrifice. How many of us today would do the same? How many would not? Yet, we all enjoy the result of their sacrifice. In generations past, it was customary to regularly visit cemeteries and remember loved ones. I remember for years my grandmother had a granite bench on the family plot where she would sit as she visited. Whole families would visit and have a picnic on their family plots. It was a wonderful custom and kept alive the memories and stories of loved ones who had gone from this earth. Sadly, people today often think that a morbid practice. And now, a remembrance of a veteran, fine gentleman, and a truly great man. William E. Krilling was a great shooter, a remarkable coach, and quite the character – in a good way! In some ways, he reminded me of my first coach (about whom I must blog some day): tough as nails and yet a very gentle spirit. Though he did not give his life for his country, he would have and almost did in Korea. (More on that in a moment.) So, in theory, we should remember him on Veterans Day instead of Memorial Day. He just recently died, so I decided to write about him today instead of waiting until November. I could not come to his memorial because I was running a state qualifier match that day. I like to think he would have wanted it that way. Bob Aylward said Bill would know I was there in spirit. We knew him as “Bill” and my time with him was far too short. At the time I first met Bill, he was retired from the Army and as a civilian employee was the coach of the International Rifle section of the US Army Marksmanship Unit (USAMU). He was a great a shooter, coach, and was an official at numerous Olympic Games. Even though I was nobody, he saw my desire and my hard work and always encouraged me. Even though I was just a club level smallbore prone shooter, he worked with me a couple times when we could match our schedules. I saw him frequently at the 1996 Atlanta Olympic Shooting Complex and at his home ranges at Fort Benning. (I was on the volunteer staff helping run the Olympic facility, working for Gary Anderson, managing all the electronic target scoring operations, and officiating many competitions. I did the same at Fort Benning from time to time.) He and Gary helped me learn my way around a range as an official. Later that day, Dr. Dan Durben (my primary coaching mentor) told me that he needed a jury and only had two members. Would I be the third? I agreed, of course. An incident had taken place as part of a final round during a USA Shooting selection match that was taking place then, and a protest had been filed. It turned out that the other two members of the jury were Frank Briggs and Bill! The three of us and Dan spoke and, because both of them were affiliated with the USAMU, and because the athlete filing the protest also was with the unit, I was elected chair of the jury. It sounds like a TV show setup: “There I was on my first jury and as a rookie I was the chair with the other members being big time old hands.” We went into Bill’s office and with no fanfare or comment he motioned to me that, as jury chair, I should take his seat behind the desk and he and Frank would sit in the guest chairs on the other side of the desk. I had assumed that, being his office, he would sit in his own chair and that as junior man I would be the last one to sit there for that meeting. Bill always understood the details. We saw each other numerous times through the years before his retirement and a few times afterward. We served together on the jury for the state high school championship for many years. His granddaughter Laura competed in that event at least one year that I recall. On March 2, 2001, a retirement dinner and celebration was held in Bill’s honor. I was lucky enough to be invited. When I was led to my assigned seat I was surprised that it wasn’t in some back corner! The room was full of military leaders and international shooters, including possibly one of the largest collections of Olympic shooting medalists ever in one room. As if that weren’t enough, the gentleman seated next to me on my left was in perfect uniform, with one added unusual item. Tight ribbon around his neck, light blue, thirteen white stars, and a medal. Yup. It was then Major (now Colonel retired) Gordon R. Roberts who at the time was the youngest and only currently active duty recipient of the Congressional Medal of Honor. The room was full of dignitaries, and a few surprises including the retired chief of staff of the South Korean Army. The link below to the retirement dinner article lists numerous other distinguished guests. But the biggest surprise was Bill’s old company commander, Captain Odderstol, who had recommended Bill for the CMH, ultimately resulting in his Distinguished Service Cross (DSC) award. There wasn’t a dry eye in the house when those two were reunited for the first time since 1953. After dinner there were a number of distinguished speakers with a lot of laughs and memories. Even Lones Wigger laughed with delight when his coaching “skills” and Bill’s were compared! (Though not noted for his coaching skills, Lones is a great shooter!) Finally, Colonel Arnold, Commander USAMU, was at the podium. He asked us to stand and then he read the citation for Bill’s DSC. The award, though given to Bill in 1953, had never been officially presented in a ceremony. You could have heard a pin drop. When Colonel Arnold finished reading, the room erupted. Even the solid old Iron Works building complex shook and the roar was deafening. Afterward there was much socializing among the crowd. It was a fun evening honoring a great person. I have a photograph with Bill from that night which I treasure along with memories of him. He was a treasure. Bill was also an incredible competitor in his own right. Remember Roger Bannister who broke the “so-called” mythical 4 minute mile “barrier” in 1954? Bill is our sport’s Roger Bannister in a way. He was the first ever to fire a perfect 3200 in NRA conventional prone smallbore rifle competition. He earned numerous other awards in his career and then became a coach and his athletes won even more. 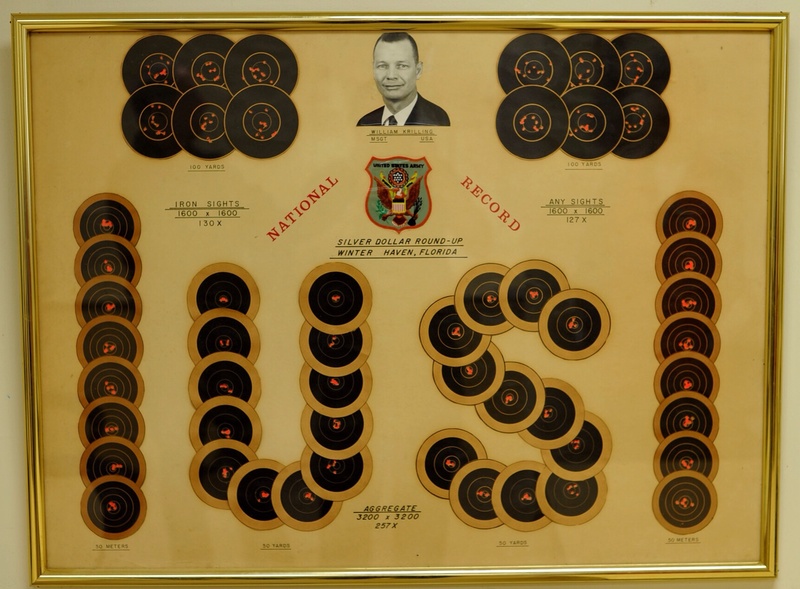 The photograph above, taken earlier this year, is of a framed set of targets that Bill fired, scoring 3200-257x. I believe these are the targets from that first 3200, though I welcome details on this set. Last year, while attending a sniper school graduation (where one of my students distinguished himself), we took a detour afterward and my student took a picture of me next to the sign for the WIlliam E. Krilling Range on Fort Benning. It has now become another memory of a great man. Also, search the web for William E. Krilling for other articles and photographs. This posting is much longer than normal because it is “close to home” and this young man deserves more than a few words. This also shares what it feels like to be part of a gold star family, if only at a distance. Too many families over the generations have felt this pain. If you have not been touched by a loss like this, I hope you will read and understand a tiny bit of what those families feel. And now, a personal remembrance of one young man who left us far too early. 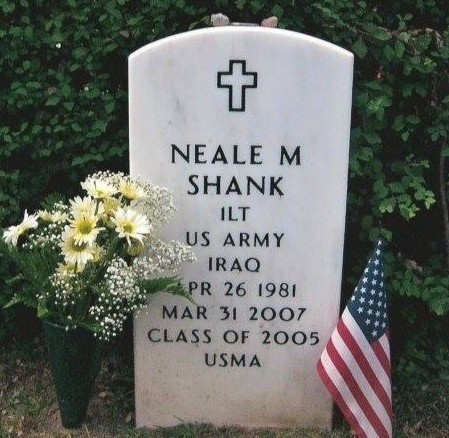 Neale M. Shank was more than just one of my target shooting students. He was my wife’s cousin and I knew him from a very young age. His older brother Luke was my very first student and is still a shooting student of mine to this day. Neale was a gentle soul. Quiet, contemplative, kind, and warm. Neale was a man’s man. Strong, active, daring, and accomplished. Neale was sensitive, fair, and just. Men respected and admired him. Women respected and loved him. Neale was what some call a one percent kind of person. The one who is going places and making good things happen in our lives and in our country. That is what he was about. That was his calling and he had the chops to make it all happen. We truly are diminished. He was a remarkable young man. We never got to spend enough time together, though I always sensed an amazing spirit within him. A few hours before he deployed, Neale called me and we had a very nice and very long chat. It was at once enjoyable and yet haunting in another way. It was almost as if he was saying goodbye forever, not just saying so long for now.That very thought came over me as we hung up the phone. Eerie. Somehow, even then, he knew he would never return to us alive. Indeed, he did not. Neale deployed in July 2006, was wounded in action October 2006, returned to active duty, and promoted to First Lieutenant on November 2006. Then, a few months later, it happened. I remember getting the call from Neale’s dad at 6:00 am. I lay in shock in the darkness for 30 minutes. Then it dawned on me that I had to get up and call one of my young best friends because I had to be the one to give her the horrid news: one of her closest and dearest friends in all the world was no longer with us. Hardest thing I ever had to do in my life. By far. But I knew I had to be the one to tell her. She later told me I was right. It was wrenching for both of us. We cried together on the phone a lot that morning. And at other times later. Then I had to go collect my wits and emotions to greet prospective students and parents at a college activities and events open house, followed by an afternoon training session with several athletes. I was numb all day. I cannot imagine how his parents, grandparents, and siblings felt that day. Rough day but we all got through it somehow. Some days later, we found ourselves, family and a quite a few friends, sitting facing a closed large hanger door, inside a small aircraft hanger on the edge of the Fort Wayne airport. Neale’s parents and grandparents, his sister Naomi (with whom Neale was quite close, almost like a spiritual twin), and a number of us, sat in shock. Presently, we heard the small jet from Dover AFB (Delaware) taxi up and stop outside. Shortly the hanger door was raised and we saw Luke deplane. Through the open aircraft door we could see part of the flag-draped casket of his brother Neale. (Luke, an Annapolis graduate and naval officer at the time, had been plucked off his ship in the Pacific and flown to Dover to accompany his brother home.) The honor guard and funeral directors brought Neale into the hanger, the door was closed, and a short ceremony was held. The motorcade to the funeral home was next. Because there were war protesters at some of the military funerals around the country at that time, the Patriot Guard Riders were in full force for Neale. They had a huge contingent of riders. It was quite a spectacle, the police escorts, the PGR, the hearse, the limousines, and all of us following. At the funeral home we gathered inside to see Neale. Immediate family first. Then more of the family. Because she had grown up with Luke (being his age) and Neale, and thus was almost family, my young friend was invited in with us. We couldn’t breath. We were shaking so much we could barely keep our legs underneath us. The folks at Dover had done an amazing job. Just the fact that we were able to see him was testament to their care and skill. He looked peaceful, though a bit older and not quite his normal skin tone, as one would expect. His uniform was impeccable, just the way he would have insisted. Neale was home. There were two visitation periods scheduled, one for the afternoon and another that evening. So many people came that it was all blurred into a day-long marathon of well wishers that lasted well past the scheduled 9:00 pm ending. The PGR stepped in and helped folks find parking and directed traffic out on the streets. The next day was the memorial service. The local veterans associations, realizing that there wasn’t an available church in town big enough for Neale’s memorial, had rented part of the coliseum and had it properly and reverently prepared. When I entered, I was stunned at the number of chairs. So I counted. Rows times columns times sections… over 1,500 chairs. Every chair filled up. And then some. Standing room only. What a tribute. Did I mention that he was a remarkable young man? There were three eulogies. Each was more than anyone could hope for to remember a man as incredible as Neale. Ever see three grown men cry? Including an active duty US Army Colonel? And a Major? and a Pastor? In public? In front of God and everyone? We cried with them as they delivered beautiful remembrances of Neale. A few days later, my young friend, her husband, another close friend of their’s and Neale’s, and I, along with the family, gathered at West Point for the burial. At the local funeral home, we were greeted by a number of folks, including the general who was the superintendent of the US Military Academy there at West Point. Soon afterward, we found ourselves arriving at the on-campus cemetery, high up on the top edge of the bluff overlooking the river. The day was dark. The day was cold. The day was windy. The day was wet. The bitter rain drove into our faces. I thought it fitting in an odd way. Our hearts were heavy and so were the skies. As we entered the cemetery, we saw the grave site with its tent and chairs, the color guard, the bugler, and the rifle salute squad in a far corner, all of which were anticipated. Then we saw a rather large contingent of cadets in their long gray coats in formation off at a respectable distance. As we got a bit closer, though still at a distance, we saw their faces. Red and puffy. Not from the driving rain, but for the same reason our faces looked that way. These were seniors and juniors who had been freshmen and sophomores the year Neale graduated not quite two years earlier. This wasn’t another formal honor contingent. These were his kids. These were his friends. He had taught and guided them. They had arranged with their professors and commanders to miss class and stand in the rain all morning to pay respects to their friend and mentor. Read some of their comments in Major Scott’s eulogy, linked below. In that formation I lost count at over a hundred of them. Though his time on this earth was short, we are in a better place for having known Neale. From time to time, though the journey is long, friends and family make the trek to West Point to visit Neale. Some have already made plans for this summer. It is something I plan to do as well at some point. Since there is no granite bench nearby, I might take a chair so I can sit a while with him. It would do me well.